Lipids have diverse structures, but the most common functional groups are ester (both carboxylate and phosphate) and alcohol groups. Other functional groups are amide and ketone groups. Waxes such as beeswax have an ester group. 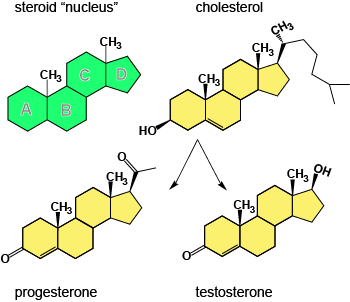 Triglycerides (fats) such as tristearin have ester groups. Phospholipids such as lecithin contain carboxylate and phosphate groups. Sphingolipids such as sphingomyelin contain amide, phosphate , and hydroxyl groups. Steroids contain mainly alcohol and ketone groups.